Editor(s): Mickaelian, A.| Lawrence, A.| Magakian, T.
Astronomical surveys are the main source for discovery of astronomical objects and accumulation of observational data for further analysis, interpretation, and achieving scientific results. Vast amount of data collected with many ground- based and space telescopes using large fields and modern detectors led to the collection of Big Data in astronomy. Large amounts of data require new approaches to data reduction, management and analysis. The International Symposium Astronomical Surveys and Big Data brought together astronomers and computer scientists to discuss large astronomical surveys, catalogues, databases, major upcoming surveys, and new tools and techniques for working with large data sets. Conference topics included historical surveys, exoplanet searches, stars and nebulae, extragalactic and cosmological surveys, cross-identifications between surveys, future large-area surveys, digitization of astronomical data, astronomical catalogues, and archives and databases. This volume reviews the results of multi-wavelength studies, including gamma-ray, X-ray, UV, optical, IR, sub-mm/mm, and radio wavelengths. 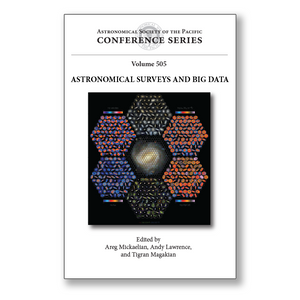 It will be useful for researchers and students interested in astronomical surveys, astrostatistics, astroinformatics, computational astrophysics, virtual observatories, and laboratory astrophysics.